The best exercise is that which you do. The same applies for incentive programs. They can be elaborate, planned and refined, or they can be haphazard and random. You know what? If you have one, it will work. It will help some of your students focus on their tasks. Mini Owl Incentive Chart -my personal favorite. I'll show you the way mine works below, but know that it is not without its flaws. I'm not always consistent - either in what the rewards are or with who gets them. Some students remind me, "Shouldn't I get some music money for that?" and others wouldn't dream of reminding me. Some don't think about music money until the recitals. If you're not in the mood for something elaborate, you can use something pre-made like these adorable Mini Owl Incentive Charts. They come in packs of 30, and you could use one for each student. Choose something that you'll give them as a reward, and you're done. The Owls are my favorite, but they also come in Pirate, Out-of-this-World (kind of a space-theme), and even Hungry Caterpillar. There is something for almost any age. Kids like prizes. Having an array of different kinds of prizes used to seem daunting to me. Then I realized that it didn't matter that much exactly what they were, it just mattered that there was some way to recognize their efforts. Even kids from the wealthiest families like to get prizes. I've seen sophisticated kids go crazy over stretchy mice and cheese. Because of my personal values, the prizes I provide are gender neutral and not full of sugar. This eliminates Princess stickers and candy. That's just me. Perhaps you'll have drawers full of Disney mermaids and Snickers bars. Decide what kind of behavior you want to reward with music money. Here's a sample Price List. Find a container for your prizes and put it in a place where kids will see it. I use a set of plastic drawers. Mine is in my waiting area. The rule in my studio is "Only open one drawer at a time." Otherwise the $100 prizes will get mixed up with the $400 prizes. Then the fun part: fill the drawers with prizes. I'm often asked how I pay for the prizes; I pass the cost along to my students in my materials fee. I buy a great deal of tiny prizes at reduced prices online, but I also shop at office supply stores and raid their clearance sections. For a few of my older students who have worked diligently, I've splurged and purchased $10 iTunes gift cards. I used to try to price things at about $100 in music money equals $1 of real money purchase. A better idea is to have an older student help you price things. How much you paid for something, especially if you got a good deal on it, isn't a good predictor of how popular it will be with kids. Prizes for tweens and teens: Blank journals, magnets and fancy paper clips, desk set. 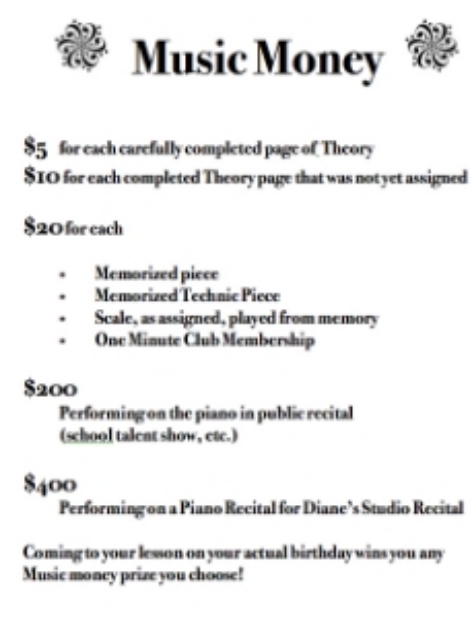 I give every student $400 for playing in a studio recital. My most expensive prizes are priced at $400, with the exception of the iTunes gift cards which I prices at $1200. (There were a few kids who had hoarded their money AND worked hard!) My rule-of-thumb is that every kid should be able to buy something small every other month or so. Some kids like to get lots of little rewards. Some kids are thrifty and like to save their money. If too many kids aren't spending, I'll have an end-of-the-summer-sale-and-you-have-to-spend-all-your-money-right-now event to get my cash supplies back. I used to think that every other teacher had a perfectly put-together system for everything. Then I realized that we're all just doing our best. We try to be organized, we strive for consistency, but we all fall short. Is it time for you to stop trying to design a perfect incentive program? Should you just grab some Music Money, or an incentive chart, a few prizes and start one? I bet you'll be glad you did! Would you like some help with studio business basics?